Nothing beats a mug of hot chocolate in the winter months! Most of them time, I’ll buy the powder to keep things simple. When I’m feeling more productive, I’ll make a batch of homemade hot chocolate. I love to add little twists to the recipe though to keep things fun and interesting. I’m over at eBay again sharing 11 easy ways to spice up your hot chocolate. Give your next mug a little zing! Who knows – maybe you’ll discover a new favourite recipe. Head over and check out the tips! I have not had a nice cup of hot chocolate in a while! I haven’t had hot chocolate in a while! I love Hot chocolate and I need a new cup and I want to Try caramel drizzle on top, It sounds delicious and I like caramel on anything. Thanks for the fun ideas! I love the ideas to use Nutella or peanut butter! and of course, more whipped cream! I love the cat mug! I love adding peanut butter to my hot chocolate. Those snowman marshmallows are just too cute! My entire family is crazy for hot chocolate! Last year, I got gourmet marshmallows for my kids. Fall and Winter are my favorite seasons. I am more of a coffee drinker and my children love hot tea. I have never tried to make homemade hot cocoa. This sounds like a nice project to try with my children. I want to try the caramel drizzle in my hot chocolate. I like spicy Mexican chocolate too. Hot Chocolate is a popular drink in our house. I love mixing a spoon of instant coffee with my hot coco. I love to make fancy hot chocolate with whip cream and caramel drizzle. It is a delicious way to warm up on a chilly day. These are great Hot Chocolate recipes. I have not had any since last winter. I will have to make some tonight. 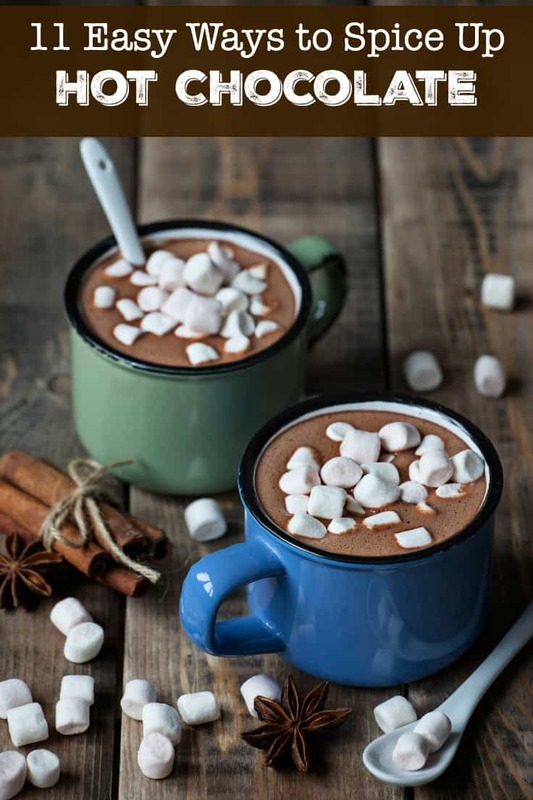 I can’t remember the last time I had a cup of hot chocolate, but I love your suggestions for add-ins they all sound wonderful and very tasty!! Hummmmmm, I`ve had cinnamon & peppermint hot chocolate, but never tried adding peanut butter, definitely going to try it sounds delicious! This is sooo my kind of post. I love Hot Chocolate… and prefer it over coffee most days. My friend all laugh when they say do you want to meet for Coffee… or I mean Hot Chocolate? Love it! My family loves hot chocolate! I will need to try some of these out! These are great ways to spice up hot chocolate. It’s hard to believe that its this time of year already. I love these ideas – very imaginative! I certainly will try the Mexican Hot Chocolate with a bit of spice…and I really like the idea of special marshmallows. Mexcian Hot Chocolate is my favorite since it’s so spicy. I love all your other hot chocolate ideas too, so I can change it up all winter long.